What is it? A beautifully styled procedurally generated survival game, with crafting and rafting, fighting and biting, trapping and sapling and a river that runs through it. If you enjoy games like Don’t Starve then this is certainly worth your time! Everyone loves a survivor! And in the survivor genre there seem to be quite a few games trying to do just that. The Flame in the Flood is a contender in this flooded (see what I did there?) market and it has the right stuff to survive longer than most. You play Scout, a young girl in a world seemingly overrun by a massive flood. Derelict buildings aplenty and the only thing that still works is the postal service. Aesop, a dog, finds you and you are intrigued enough by this dog to set out from relative safety and follow the massive river in flood to wherever it may lead you. Along the way you need to manage hunger, thirst, temperature and rest. It sounds similar to The Sims, but this is not a doll house you are in! With her little raft, Scout follows the procedurally generated river through rapids and around islands, stopping at selected campsites, stores and Mother Nature herself. Here she can collect resources for crafting anything from clean water to complicated traps. Some stopping sites allow you to repair and upgrade your raft. Add better steering with a rudder, or add more storage space for those very valuable resources. When on foot, Scout explores the rest stops and scavenges for anything useful. She will find some characters along the way who, if treated well, will reward her with hard to come by resources and weapons. Sometimes they just offer her the basics of a place to sleep. Wolves and bears and other fauna are all hungry and grumpy as well. A little girl will make a nice snack. Scout is not entirely defenseless. She can craft traps and harvest more resources from the animals, although flight is better than fight! Managing the collected resources in the limited inventory is where one of only a few problems rears its head. It simply feels lacking in the beginning but then becomes second nature in a few minutes of play, especially when using a controller, as the game controls feel average with a keyboard and mouse… so it also makes the world of difference when steering the raft down perilous rapids. A few game crashing bugs also popped up here and there, and can be annoying when you have not passed a checkpoint in a while. I simply love the game’s art style, almost feeling like a children’s story book that has come alive. The animation is smooth and the sound is fantastic. Wait until the first thunderstorm hit poor Scout and Aesop while on the river. The little details like pieces of the raft that falls off when struck by other drifters on the flood waters add atmosphere not often found in the simpler games. 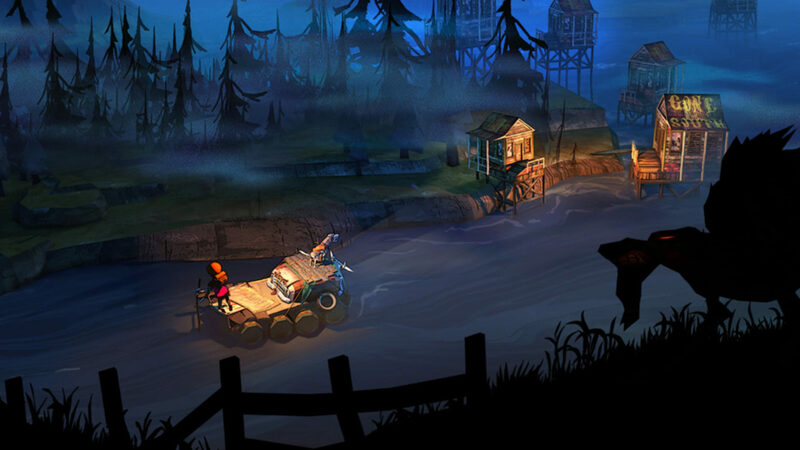 The Flame in the Flood can be hard, as survival games should. As such my games have not lasted longer than an hour at a time and makes the perfect lunchtime escape. I expect that as I progress in skill and eventually become the Bear Grylls of gaming, I might stretch it to 70 minutes. One thing is for certain though, I will be back for more often! Verdict: A real survivor in the survival genre, this is a game with depth, character and great replay-ability – I will be coming back to it often!